When you’re injured on someone else’s property and need to file a “slip and fall” claim, you need an expert legal team to guide you through the complicated process. 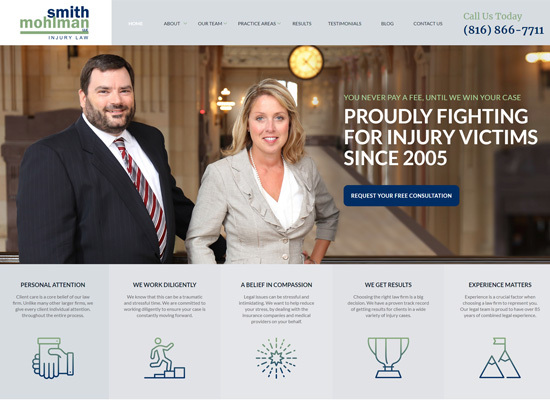 At Smith Mohlman Injury Law, LLC., we pride ourselves on protecting those who have been injured through no fault of their own. Slip and fall accidents are generally regarded as Premises Liability claims, which is the law that governs “slip and fall” accidents and determines who is at fault for them. Premises liability law generally refers to injuries occurring on someone else’s property because the property owner was negligent or created an unsafe condition. Owners, landowners, homeowners, landlords, and businesses are required to protect those who lawfully enter on the land or property from reasonable injuries. Cases can include slip and falls, fires, inadequate security, and other types of personal injury. Common situations giving rise to premises accidents include uneven floor surfaces, poorly marked changes in elevation, slippery surfaces, broken sidewalks, uneven elevators, and broken steps. After you have obtained medical treatment following your slip and fall injury, it is imperative that you contact a legal professional to assist you with understanding the options available to you, especially before you speak to the Owner’s insurance company, as doing so can adversely impact your claim. If you need legal services dealing with a slip and fall accident or other premises liability cases in Missouri or Kansas, the last thing you want to do is put it off. Please contact our office immediately through this website or at 816-866-7711 for a free informational, no-obligation consultation.